I kind of amazed myself with how much I got done this weekend. I credit the WoW beta realm for being completely unstable and disconnecting every couple minutes, making it not worth my while to play all weekend. Sunday I spent a number of hours working in the back yard. I got my sakura and ume trees pruned, which I've been meaning to do for weeks, cut back the wisteria again, and weeded one of the strawberry patches, which is starting to produce its second crop of the year. I also packed away another quart of blackberries. The first lotus flower of the season was in full bloom and very lovely. The grapes are starting to soften up and take on the translucent quality of ripeness. They're not quite ready yet, but I couldn't help tasting a couple. Wow, they are good. Super sweet, with a burst of muscat spiciness up front and a clean acid finish. 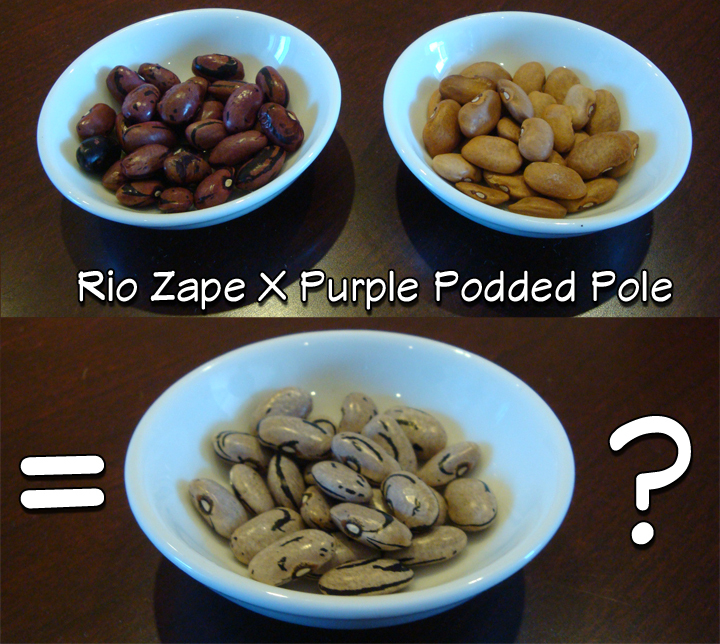 I picked a couple more kinds of beans, this time from a Rio Zape × Purple Podded Pole cross. I'm super excited about this particular trial. So far one plant is producing white seeds with black stripes and another has pure lavender seeds. It's so hard to wait for the pods to dry. Today I attached an insulated water bottle to my bicycle. When going on a shopping trip on a hot day, it makes a world of difference knowing I can stop for a drink of cold water anytime I want. I should have done that years ago. Then I went out and stocked up on cleaning supplies and other things I'll need in preparation for having guests over in a couple weeks. I ran into a co-worker while at the store, which I think is a first. After I got home, I picked a bunch more cherry tomatoes. I took a whole container full to work last week, and now I've filled the container back up again. It's hard to believe I'm getting so much production just from the two plants that I let grow as volunteers in the front yard. The main crop tomatoes in the back yard are only now starting to flower. The parsnips that I let flower by the pergola are now dropping their seeds everywhere. I know that fennel grows wild here, and since parsnips are in the same family, I'm hoping that they'll naturalize in the yard and do just as well. Food that will grow on its own without any effort from me, has a root strong enough to out-compete the weeds, AND can be harvested in the winter is definitely something I want to encourage. I collected a bag full of seeds anyway, to keep them in the house over the winter, so I can try planting them in the spring just in case the ones left outdoors have trouble.